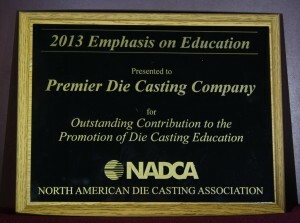 The Emphasis on Education Recognition Award was won by Premier Die Casting Company this year. This Award recognizes a die casting company that has had a specific focus on die casting education and training for their workforce. 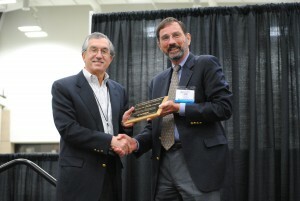 The Award is chosen by NADCA Education Staff and the Educational Committee Chairmen. The selection criteria for outstanding contribution to the promotion of die casting education includes the number of NADCA courses held over the past year, the total number of employees exposed to the courses, and consistency in offering courses over the past three years. Premier Die Casting Company has been in business 68 years and has a diverse customer base that serves many industries and markets. Today Premier is growing and hiring employees to meet the demands of the current economy. Premier utilizes state of the art equipment in manufacturing high pressure aluminum die castings such as robots, computerized process monitoring, die temperature control systems, and late model CNC machine centers that machine the castings produced to exacting dimensions. With a trained work force Premier is in a position to offer high quality and cost effective aluminum die cast parts to the global market.